I heart composed salads. There’s no better or more beautiful way to serve seasonal vegetables. And it takes no longer to make than a traditional toss-it-all-in salad but the act of composing each ingredient into sections elevates it to something special enough for company. 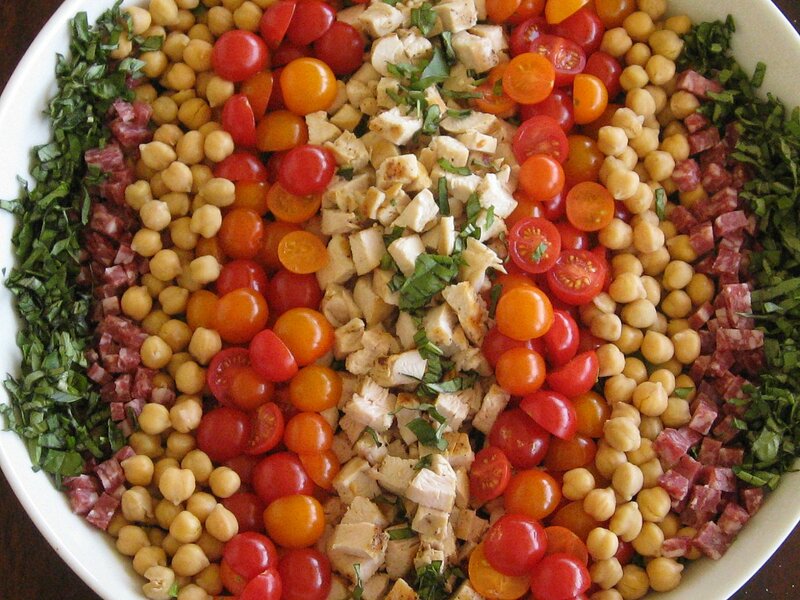 Composed salads are traditionally hearty enough to serve as a complete meal, almost always incorporating protein–e.g. tuna in salade niçoise— which makes it the perfect way use up any chicken or steak left over from your weekend barbecue. Thrifty, creative and beautiful to look at! 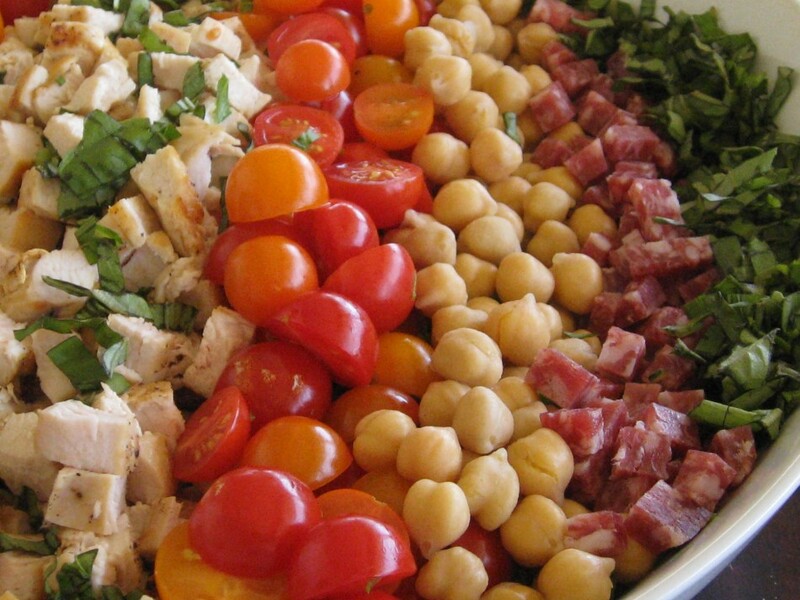 This is our composed version of La Scala’s famous chopped salad–a bed of chopped romaine and iceberg lettuces, grilled chicken, cherry tomatoes, chickpeas, salami, fresh basil and a mustardy red wine vinaigrette. Composed salads work beautifully in summer because you can choose ingredients that don’t require any cooking. 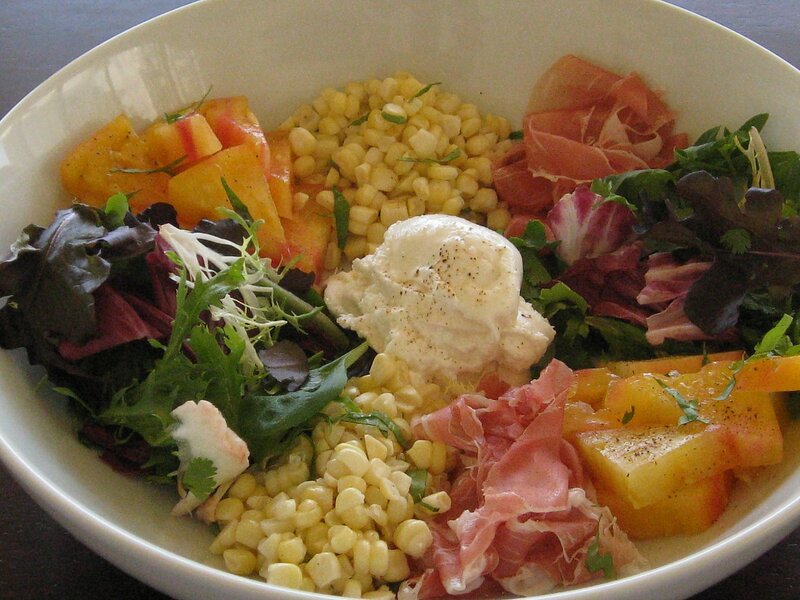 Here I mimicked the bowl shape by building my salad around a ball of burrata at the center. I added mixed greens, fresh corn kernels tossed with basil and a little apple cider vinegar, prosciutto, and chunks of gorgeous yellow gold heirloom tomatoes. I served it with grilled crusty bread and olive oil and balsamic vinegar on the side. 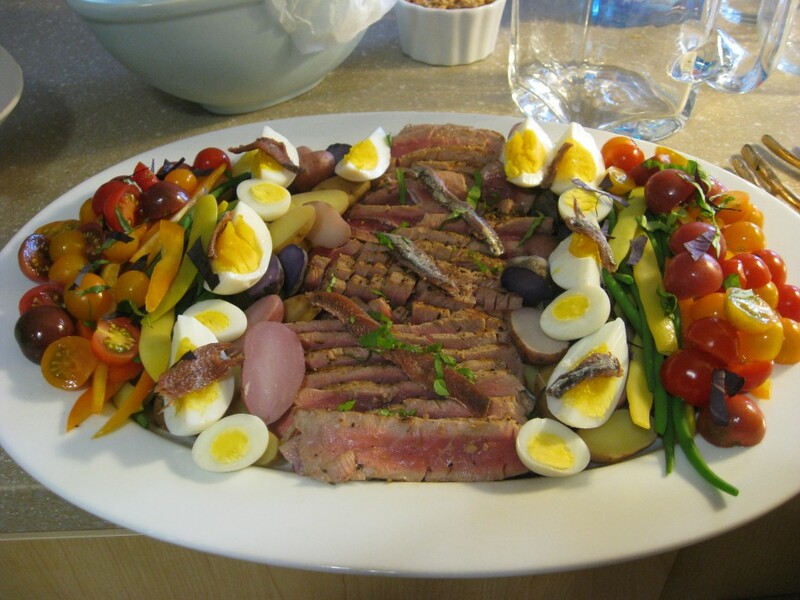 I composed this ahi tuna niçoise for friends one sultry July night. I grilled the ahi ahead of time –using an electric stove for the first time and sadly overcooking the beautiful tuna!– and boiled new potatoes, yellow and green beans and quail eggs. I added crunchy peppers, anchovies and fresh basil and served it with mini pitchers of basil vinaigrette from David Tanis‘ A Platter of Figs and Other Recipes. Lydia gave me the book for my birthday last year and I love flipping through it for ideas. Tanis adds a magic touch to simple dishes, like drizzling homemade rosemary-infused olive oil over a basic bean soup, and builds a complete menu around each recipe. Don’t you love it when cookbooks do that? So helpful and inspiring. What salads will you be composing this summer? Put the shallots and garlic in the red wine vinegar, adding a little salt and pepper. Crush the basil leaves and add them. Let sit 10-15 minutes. Whisk the olive oil into the vinegar mixture. Taste and adjust the seasoning. Let the dressing stand for half an hour, then remove the basil leaves. Use the vinaigrette within a few hours. Or you can do it my way which is to puree all the ingredients together in a mini food processor so you get a green basil vinaigrette. Yum! These all look so healthy and delicious! I love your blog! Whoa, I love this. Great idea for an easy dinner for company on a hot summer night. Pictures are gorgeous, too!